Henshaw, Fred M, head-of-household, age 34, born in Iowa; parents born in Iowa; first married at age 24; owned home ($5000 value); radio in home; occupation: clerk, telephone co.; World War I veteran. 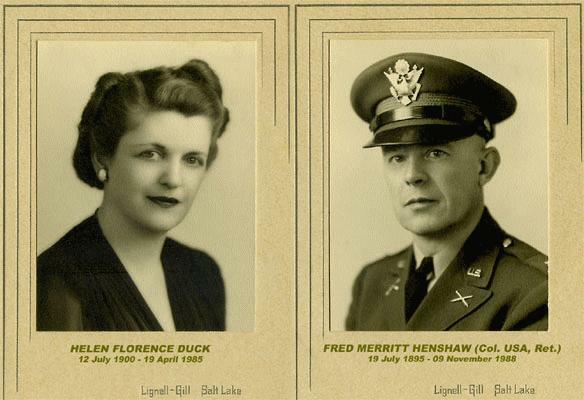 Henshaw, Helen F, wife, age 29, born in Oregon; father born in England; mother born in Ohio; first married at age 19; occupation: stenographer, bank. Henshaw, James L, son, age 6, born in California; father born in Iowa; mother born in Oregon; attended school. Henshaw, Elisabeth J, daughter, age 5, born in California; father born in Iowa; mother born in Oregon. Duck, Mary E., mother-in-law, age 55, born in Ohio; parents born in Ohio; married, first married at age 22; occupation: house keeper, private home. Henshaw, Fred M, head-of-household, age 44, born in Iowa; completed 1 year of college; on Apr 1 1935 was living in the same house; owned home ($7500 value); occupation: commercial representative, telephone co.; worked 52 weeks in 1939; $2500 wages in 1939. Henshaw, Helen F, wife, age 39, born in Oregon; completed 1 year of college; on Apr 1 1935 was living in the same house; occupation: secretary, building materials; worked 40 weeks in 1939; $750 wages in 1939. Henshaw, James L., son, age 16, born in California; father born in Iowa; mother born in Oregon; completed 4 years of high school; on Apr 1 1935 was living in the same house; attended school. Henshaw, Elizabeth J., daughter, age 15, born in California; completed 3 years of high school; on Apr 1 1935 was living in the same house; attended school. Duck, Nancy E., mother-in-law, age 66, born in Ohio; completed 2 years of high school; on Apr 1 1935 was living in the same house; widow. 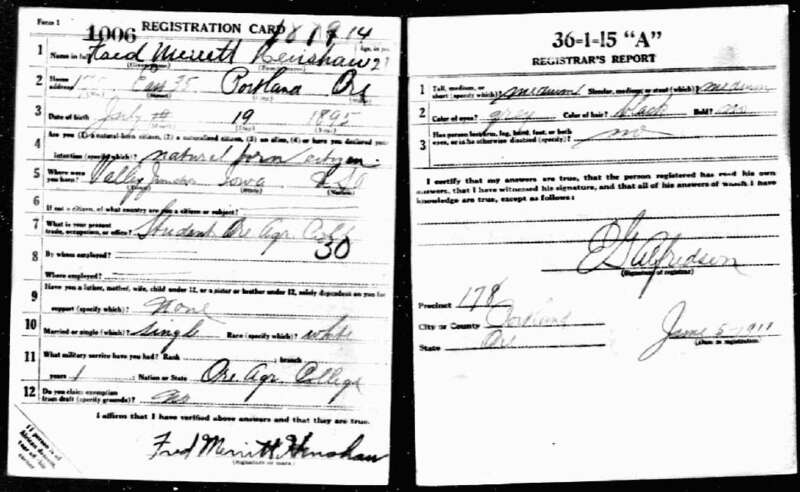 1930 census, Portland, Multnomah County, Oregon; roll T626-1952, ED 361, page 1A, line #45, dwelling #14, family #14. 1940 census, Portland, Multnomah County, Oregon; roll T627-3389, ED 37-257, page 4B, line #66, household #94. 1900 census, Valley Junction, Walnut Township, Polk County, Iowa; roll T623-455, ED 110, page 4B, line #58, dwelling #83, family #89. 1910 census, Valley Junction, Walnut Township, Polk County, Iowa; roll T624-418, ED 180, page 16A, line #4, dwelling #153, family #169. 1920 census, 1074 E. Alder St., Portland, Multnomah County, Oregon; roll T625-1501, ED 109, page 6B, line #58, dwelling #137, family #155. Photo courtesy of Jim Greaves.